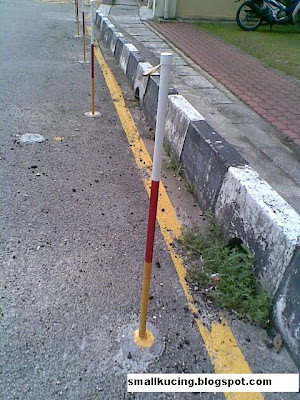 Baru last month the fella re-painted the yellow line. Stating that residence tend to park at the side of the building instead of proper parking space. Mamarazzi already told the fella that re-painting Yellow Line won't work. Just Clamp the cars. Sure works wonders. Degil betul. Yesterday, the fella went and poke all these steel rod along the building. What an eye sore. Making the building look hideous. Not only that! When Mamarazzi shake the steel rod a bit...can feel it shaky and will come out any time. Now! that is what we call a waste of money. Just buy Wheels Clamp! 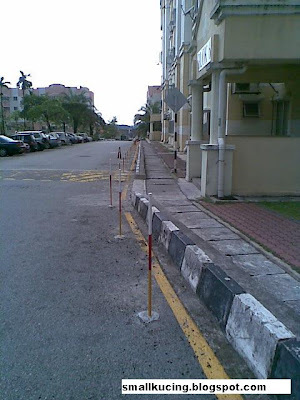 Sure nobody dares to park there anymore after kena a few times. ...Haiz...what to do...it's like talking to the wind.